The dark, inner shadow of planet Earth is called the umbra. Shaped like a cone extending into space, it has a circular cross section most easily seen during a lunar eclipse. For example, on January 21 the Full Moon slid across the northern half of Earth's umbral shadow, entertaining moonwatchers around much of the planet. In the total phase of the eclipse, the Moon was completely within the umbra for 63 minutes. Recorded under clear, dark skies from the hills near Chiuduno, Italy this composite eclipse image uses successive pictures from totality (center) and partial phases to trace out a large part of the umbra's curved edge. 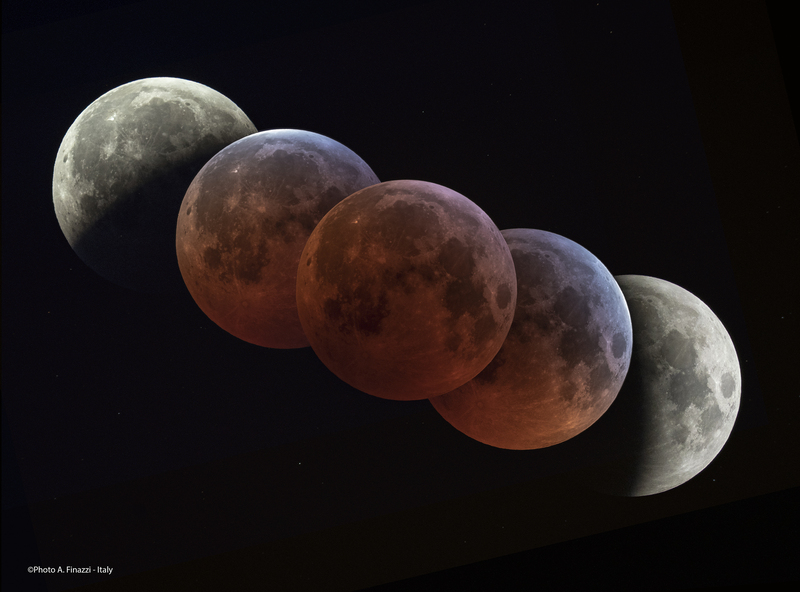 Reflecting sunlight scattered by the atmosphere into Earth's shadow, the lunar surface appears reddened during totality. But close to the umbra's edge, the limb of the eclipsed Moon shows a distinct blue hue. The blue eclipsed moonlight originates as rays of sunlight pass through layers high in the upper stratosphere, colored by ozone that scatters red light and transmits blue.